Many homeowners choose to illuminate their sidewalks, trees, or other areas of their property as a way to enhance its beauty. Visitor’s eyes will be easily drawn toward your favorite gardens, a spectacular tree, or the gorgeous craftsmanship of brick or stone on your home’s façade. Lining a sidewalk gives guests a clear pathway during nighttime hours, and lighting around a pool creates an ambience that makes everyone feel welcome. A well-lit property is a huge deterrent to thieves and other non-do-gooders, so keep that in mind when planning a lighting design for your property. At Waterville Irrigation we rely on the high quality products of Cast Lighting and Sollos product lines. 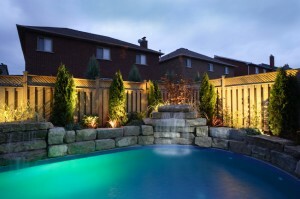 Our landscape lighting is always low-voltage and because we only use LED bulbs, it is extremely energy efficient. The longevity of your landscape lighting system is further enhanced when we bury the lines keeping them protected from weather and curious creatures. Imagine how you can transform your home both in beauty and safety with landscape lighting around your property. Have design questions? Need some expert advice? Want a quote? Get in touch, we’re waiting to help!